A bit expensive, but I'm using amsoil 5W-30 also and my engine runs good. Well I'm going to go with the Amsoil signature 5w-30 or the 5w-40... I would rather the 40 but that's not in the signature series, and it also comes in a mid or high sap, I know X said between those 2 the mid sap, but is sap even good? or would the 30 be better? Some engines can be damaged by running an oil that is too thin for cold start and warm-up running, especially with cold piston to bore clearances. For example there will be excessive piston and bore wear in the engine in my wife's Opel if anything less than a 10W30 or 10W40 is run in that engine, and similarly with my Triumph motorcycle which must run 10W40. There may be a reason why Hyundai specified 5W40, and often the 5W is more important than the 40. I don't know why so many want to ad-lib with their cars. Hyundai is a big company which has built millions of cars and they aren't stupid. If the VT will run 0w30 or 0w40 or 5w30 or 5w40; don't you think they would put that in the handbook? But it's your engine and not mine. Go ahead and run what your heart's desire. There is a TSB around here somewhere that Hyundai recommends to use 5w-40 in the car instead of 5w-30. If I remember right they went up to thicker because the 30 breaks down to be about a 5w-20 or so. I'm by no means an oil guy, but I'm not sure what the issue is with 5W-30 breaking down to the viscosity of 5W-20 if you're operating within the temps of the chart I linked in my last post. 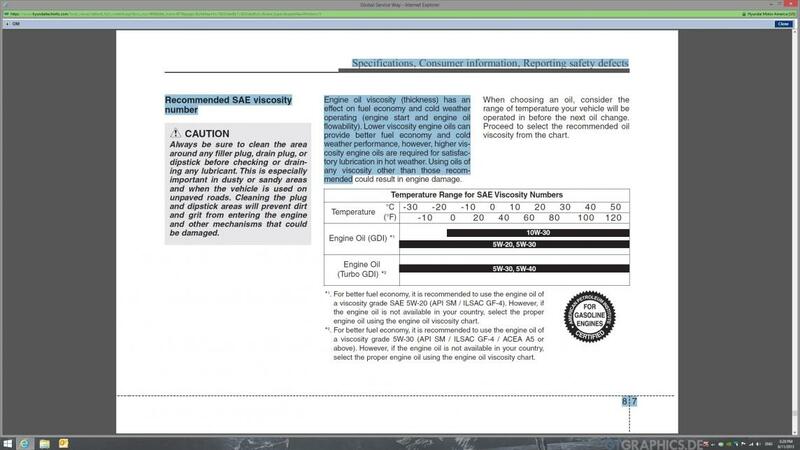 Furthermore, I tried to find the TSB you are referencing and (for the 2015 VTs) I could only find TSBs relating to the fuel line, range switch (not sure what that is) and an ECM software update. Is the TSB you mentioned only for the 13s? Can you find the TSB by chance? Professor S and msnow like this. So it is, good catch! Looks like they don't make PUP in 5W-40... bummer. Still, based on the research -X- has done, I don't feel worried about putting PUP in my VT. Thanks again for pointing out my error! I am switching today to the PUP 5w-30. I was running the Rotella but after what -X- said about if foaming I am swapping asap! I also got a filter and crush washer from the dealer. $6 including tax! I was paying over $8 for a WIX filter so I will be running OEM filters for now on. I went to the parts department of my closest Hyundai dealer to buy a filter and washer and they told me about the change in oil specification in Australia. In service 5W30 would break down 5W20 but the parts man said that there had been problems with excessive bearing wear in some engines. I told him I had been running 5W40 since the first service because I thought that a hot-running turbocharged engine would need the extra protection. You can't damage and engine with 40-weight but you can damage an engine with 30-weight.